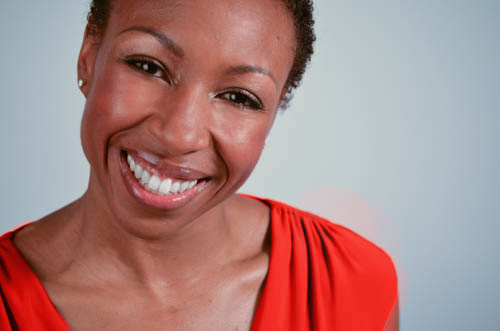 Named to Fast Company’s League of Extraordinary Women and by the Huffington Post as one of 19 women who are leading the way, Tiffany Dufu’s life’s work is advancing women and girls. She is a nationally renowned expert and speaker on women’s and Gen Y leadership. Tiffany serves as Chief Leadership officer, Levo League and on the Launch Team for Lean In. She is former President, The White House Project, and was previously at Simmons College and Seattle Girls’ School. Tiffany is on the board of Harlem 4 Kids and lives in New York with her husband and two children. My personal and professional journey are the same because my life’s work is advancing women and girls. My first formal job on this path was raising money for Seattle Girls’ School. I was then a Major Gifts Officer at Simmons College in Boston before moving to New York where I eventually ran The White House Project and am now Chief Leadership Officer for Levo League. All of these organizations have a goal of creating a world where women’s talents and voices are leveraged for everyone’s benefit. Along the way I’ve had many women mentor and sponsor me. I’m the product of their cumulative investment and I thank them for my success. My parents taught me that if you want something you’ve never had before you’re going to have to do something you’ve never done before in order to get it. For me, that means not being afraid of taking risks. The first one that comes to mind is running for class President in middle school. It was terrifying, but when I lost I learned the most important lesson: that you can fail, wake up the next morning, and the world hasn’t fallen apart. It’s been your life mission to advance women and girls, and you have served as the President of the White House Project, and most recently as the Chief Leadership Officer at Levo League and a launch team member for Lean In. What have been the highlights and challenges you’ve experienced during these positions and how have you met your mission? My mission is something I strive for consistently. I’m not sure we’ll reach the end goal in my lifetime. My highlights are always in moments when I’m interacting with women who recognize their own power. Whether they are students demonstrating their knowledge to a large crowd with unfathomable poise, or a woman who decides to run for office, or a young professional who musters up the courage to ask for a raise, I’m most inspired when I see women realizing their own potential and purpose through my work. How do you think the Lean In movement has made a difference? One of my sponsors, Marie Wilson, taught me that if you want to make any meaningful impact in the world you have to meet people where they are. And you have to leverage popular culture. Sheryl did that with Lean In. She captivated the attention of the masses and many more people that otherwise wouldn’t be are now talking about women in leadership – and doing something about it. It’s been wonderful to see. What advice can you offer those seeking a career in non-profits? The non-profit sector is expansive. It includes everything from an ivy league college to a small community center. Conduct lots of informational interviews to learn about how others navigated their path and to explore all of the different opportunities. I also think it’s helpful to be clear about your own passion so that even as you transition to various organizations throughout your career your brand remains consistent. I don’t. It’s all the same to me. I just do the best I can every day to be the kind of person I would want my children to grow up to be. I also listen to loud music and dance all over my furniture…frequently. Unconscious bias. Many workplaces purport to be a meritocracy but they are all complex political ecosystems, and the role that gender plays in them is powerful. How can we collectively close the leadership gap and advance opportunities for women and girls? Pass legislation that creates affordable childcare options for families, ensure there is equal work for equal pay, and mentor and sponsor women. I wouldn’t be here without it. My mentors have helped me to develop a level of self awareness. They help me to achieve clarity through guidance and encouragement. I consult them whenever I’m making any major decision. Their wisdom has been priceless. My mother-in-law. She is a fierce negotiator and amazing entrepreneur. If it weren’t for her, my husband wouldn’t have the assumption that ALL women are supposed to rule the world. I’m also indebted to Janie Williams and Marie Wilson, who really saw me and gave me opportunity even when others didn’t. What is one word that sums up where you have got to today? We’re passionate supporters of the Lean In movement and it was exciting to hear that a new version of the book has been released especially for graduates. Since Lean In was published a year ago, it has sparked a global conversation about gender equality. Now Sheryl Sandberg has enlisted the help of experts to create Lean In for Graduates, a handbook that offers instruction and inspiration for the next generation. 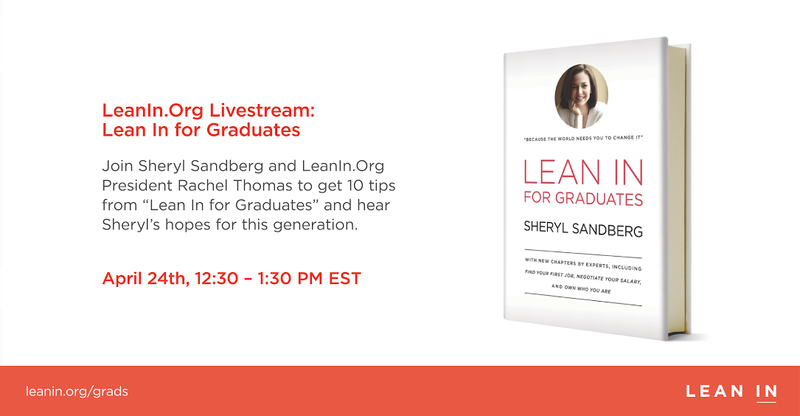 Lean In for Graduates includes the full text of the original bestseller as well as new chapters on finding your first job, negotiating your salary, listening to your inner voice, and leaning in for women of color and millennial men. 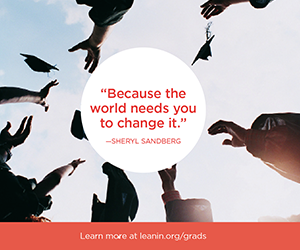 Visit leanin.org/graduates for 10 tips for graduates—and lots of great resources for sitting at the table, using your voice, and leaning way in! Make sure you get involved!